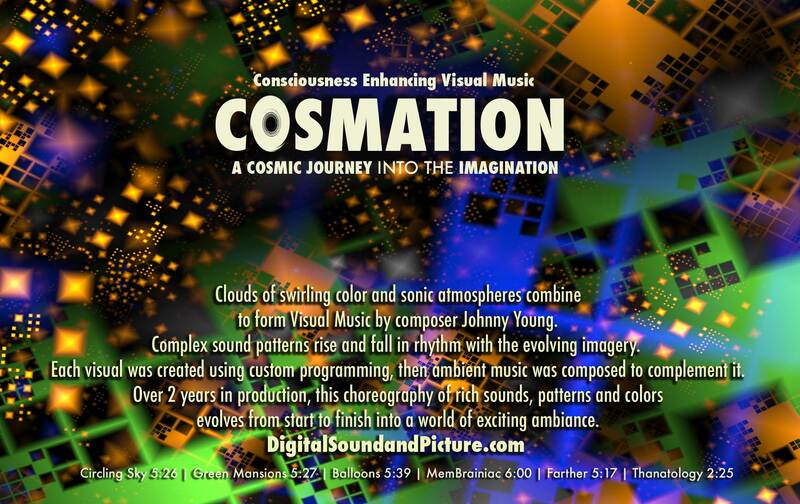 COSMATION: Consciousness Enhancing Visual Music. Featured at Digifest, 2007 in Florance, Italy. "Computer animation veteran John Young has been creating images and music for for many years. Combining two loves, his latest creation provides a basis for meditative journeys beyond everyday life." taking this journey replaces the experience of getting stoned...and it's LEGAL!!! "How to describe the almost indescribable? Beautiful colors, mesmerizing music. I absolutely love "Balloons" - Such an intensely beautiful use of color.